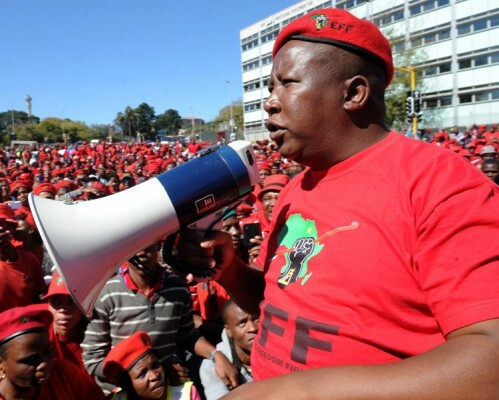 Malema ‘will go to parliament’ – Write. Snap. Click. NOTE: Article first appeared in The Citizen on May 5, 2014. Economic Freedom Fighters “commander-in-chief” Julius Malema told a rally in Atteridgeville yesterday that he intends to go to Parliament to “deliver the best of the best” to all South Africans. He was the keynote speaker at the Tshela Tupa (“Crack the Whip”) rally – his last opportunity to campaign before election day on Wednesday. The almost 30 000 strong crowd went wild when Malema made his grand entrance. Led by bikers, he greeted the crowd while walking around the track. Before he addressed the crowd, Dali Mpofu, Gauteng premier candidate for the EFF, led a demonstration of how e-tolls would be “destroyed physically” – an EFF campaign promise. Using hammers, party supporters in red jumpsuits laid into a white structure labelled “e-toll”. “Any future without EFF is suffering,” Malema told the crowd. His organisation would be around for the next 100 years, he said, and would be “handed down from one generation to the next”. The EFF is “inspiring the hopeless masses of people”, he continued. He reiterated promises of increased minimum wages, compulsory free education and land expropriation without compensation. “You will own those farms after the 7th of May,” he said. He said that the EFF was asking voters for “five years” to make a difference. Apparently addressing remarks made by City Press editor Ferial Haffajee, he explained how way grants would work under EFF policies. “We will take out the middle man (the South African Social Grants Agency)… That money will be added on top of our credits. The second money is going to come from politicians.” Money that would otherwise have been used to buy politicians cars would be given as grants to children and the elderly, he said. Politicians should buy their own cars and houses and finance their own credit cards. They earn a salary and they “should use it”, he said.